Kemarley Brown's jurni to the olympics. SAN RAMON, CA, August 09, 2016 /24-7PressRelease/ -- For the last 6 weeks, in a small space in my kitchen, I have hosted an 100m sprint Olympic semi-finalist by the name of Kemarley Brown. When Kemarley suddenly decided to return to Oakland and train with me, his former junior college coach, the kitchen is where we built his Ikea day bed and rekindled our shared vision. Back in the 2014 at the California Community College State Championship, Kemarley ran the 100m in 9.93 seconds becoming the USA's national community college record holder while representing our school, Merritt College. Not only is Kemarley the only community college athlete to break the 10 second barrier in a wind legal race but the 9.93 stands as the 3rd fastest wind legal time in history for all colleges in the United States (that's right, NCAA DI programs too). To top it off, on that day the 9.93 was the fastest time in the world for the season up to that point. The USA's Justin Gatlin went 1/100th better the next day and Kemarley's time ended up as 5th fastest in the world at the end of 2014. The sky was the limit and, while I stayed here in Oakland coaching at Merritt, Kemarley went off on his life's path. Since then it's been an obstacle filled, winding road for him to say the least but somehow the twists and turns have lead this 24-year-old Jamaican man back to Oakland, CA to live and train with me so that he can represent Bahrain in the 2016 Summer Olympics. Kemarley has begun documenting his journey on JURNI, a video journalling application perfectly suited to capture his real moments leading up to and including the Olympic games. With JURNI he has had the opportunity to share some of his training, some of his thoughts about his preparation and anything else he has felt like sharing about his life on the road to Rio. On Kemarley's journey, I have been the lucky vessel by which he has been able to pursue his dreams and in this way, I have had the pleasure of getting to know who he is as a person. This I document on my JURNI and here. On June 22, 2012 at 8:24pm Pacific time, I first had contact with Kemarley when he emailed me regarding the possibility of running for Merritt College where I am head coach. Over the 11 years I have been head coach, I have received countless emails from international recruiters and students asking about our program. I am attuned to potential scams and am usually quite skeptical when I receive these contacts. Nonetheless, Kemarley's email was intriguing especially after I searched his name and found that he had already posted some very impressive marks for his school St. Elizabeth Technical High School (STETHS) and in international competitions like the Carifta Games. We connected as people right away and began our shared journey as Kemarley made his way here seeking success on the track and in the classroom. He faced the challenges of finding housing and ways to finance his education (international students don't get federal financial aid or any of the advantages of California residents) all while training and attending classes far away from his Jamaican homeland. Still, after two years of grit and determination, through the ups and downs of injuries and life challenges, Kemarley became the 2014 California Community College Athlete of the Year (including all sports football, baseball, basketball etc.) and graduated with his AA degree in Social and Behavioral Sciences 4 days after winning the state championship in 9.93. Not lost in the success of the 100m that day at state, Kemarley also won the 200m in 20.29 and took home the Athlete of the Meet honors. All the while, there was rarely a week that went by where we didn't talk about the dream of the Olympics. It was an incredible 2 years and, in a 2nd season that didn't include a single loss in any individual race, a storybook finish athletically and academically. Kemarley had choices to make at that point. He could have turned professional right then and signed a sponsorship deal with a shoe company. I received many calls from agents and one from Nike inviting him to the 2014 Prefontaine Classic with a lane in the 100m against Justin Gatlin. He also had a full scholarship offer from TCU, a perennial 100m powerhouse. Instead, he chose to return to Jamaica and run for the famed MVP track club while attending school at the University of Technology in Kingston. These were tough, tough choices but at that point Kemarley was anxious to return home after being so far away. 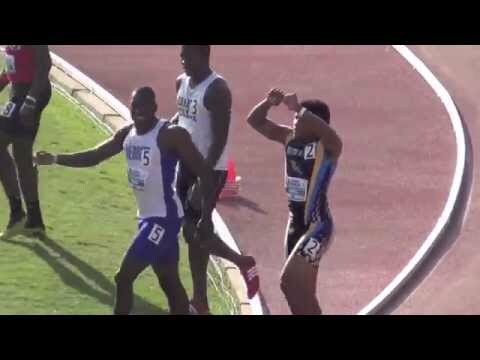 With the 2014 Jamaican national championships a mere 4 weeks away, Kemarley's choice to return home had me rooting for a national championship. Unfortunately, Kemarley didn't run in the national championship that year and life here in Oakland eventually returned to normal. We stayed in touch but I often felt at arms length as Kemarley faced his new chapter with MVP in his own way. During this time, his Jamaican coaches arranged an agreement with Bahrain so that Kemarley would become a citizen there and represent that country in competitions. It is a path that I couldn't have foreseen at graduation in 2014 but Kemarley's choices weren't easy and no matter what he chose, he always expressed confidence that it would all work out. I have no idea what would have happened had Kemarley walked a different path but it was his path to walk. A few weeks ago, rather unexpectedly, Kemarley posed the question to me, 'do you think it's a good idea if i came back to train with you?' From that point on, we have reconnected in a way that has been at once amazing, thrilling and fulfilling. This 6 weeks has been special no matter the outcome. Living with Kemarley, I have been able to share his adventure 24/7 as he prepares for Rio. The training is one thing and there's plenty of that. First, we have removed the Valsalva technique (holding breath) he had been using at the start of his races. Then we changed out his flexible spikes for a much firmer plate. Also, Kemarley has found the sweet spot for his drive from the blocks discovering the value of working with and not against Newton's laws. He has worked on reducing ground time by getting tall out of his acceleration. Finally, he's getting his rest and recovery off the track and maintaining a healthy diet. Perhaps equally or more fun, however, has been watching and sharing his life away from track. Kemarley was always well liked in his JC days because of his humility and relaxed approach to life. While supremely confident, he has an ease about him. But what many people don't realize is that he is fairly introverted. He hates publicity and gets frustrated by the social media generation always prepared to criticize from the sideline. He is careful who he shares his life with and trust doesn't come easy. He's very laid back and hopes some day he can just go fishing in his spare time. You might be surprised to know he is an anime fan. Right now as I type this, there is another window open on the computer with Inuyasha on it (whatever that is!). I often hear Kemarley listening to Youtubers analyzing different anime story lines. Also, he is a voracious learner of all things and will be on YouTube at all hours watching history, animals, futurists, whatever. Meanwhile, he quietly wears prescription lenses in thick black frames! I have come to believe Kemarley is a living Marvel character. I am happy he has decided to open a window to the world through JURNI so that more people out there can enjoy his moments that matter and get to know one of my favorite people ever! Check out JURNI and follow Kemarley (and me) for his real life moments. Interact through video and be a part of history. On one of Kemarley's Jurni posts he suggested everyone should dream big because dreams are free. For the last 6 weeks, living inside his dream has been priceless. Download JURNI on the App Store (Requires iOS 7 or later. Compatible with iPod touch, iPhone, and iPad). JURNI is a video journaling application where users capture moments that matter while allowing greater connectivity with people who are going through similar experiences and emotions. Jurni is about authenticity. It is real reality TV.